Shopping for Dr. Horribles Sing-Along Blog Statues? Do you have what it takes to join the Evil League of Evil? Sculpture is limited to just 1,000 pieces! First in a series based on Dr. Horrible's Sing-Along Blog. It seems only fitting that the first authorized and fully licensed Dr. Horrible Animated Maquette is of the man with the PhD in Horribleness himself. Cast in professional-grade resin and painted by hand, Dr. Horrible is pictured in his moment of triumph, holding his Freeze Ray aloft and shaking his fist at the world. 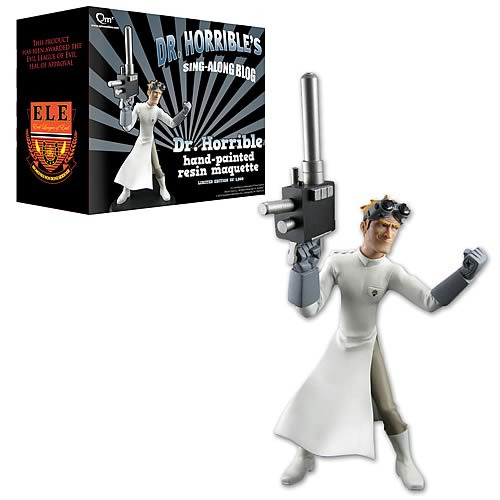 As with all Quantum Mechanix animated maquettes, Dr. Horrible comes with many screen-accurate details, such as his goggles, the medical symbol on his smock and, of course, the aforementioned de-animation gun. He stands about 6-inches tall (9-inches, if you include his weapon), comes in an edition of 1,000 pieces, and is the first in a series of limited edition maquettes based on the characters of Dr. Horrible's Sing-Along Blog. Order yours and tell your friends!